Nancy Bishop Langert was the youngest of the three Bishop sisters. On April 7, 1990, she and her husband, Richard, were shot to death in the basement of their suburban Chicago home. Nancy was three months pregnant with their first child. A 16-year-old neighbor was convicted of their murders and sentenced to two consecutive life terms–he was ineligible for the death penalty because he was not 18 at the time of the murders. The troubled young man, David Biro, has never admitted guilt in the killings, even though the .357 Magnum used to kill Nancy and Richard was found underneath his bed. Nancy’s two older sisters, Jennifer and Jeanne, were stunned and horrified–and experienced deep conflicting feelings of anger toward and pity for David Biro. They both felt compelled to forgive him, though that’s extraordinarily difficult. After two years of deep grieving for Nancy and Richard and their unborn nephew or niece, Jennifer and Jeanne begin their process of forgiveness by getting involved in efforts to strengthen gun-control laws in Illinois. Everything they do, they do in honor of the life of their vibrant baby sister. Eventually, Jennifer and Jeanne find themselves involved in a group called Murder Victims’ Families for Reconciliation. 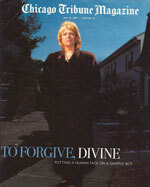 By the time I wrote a story about the Bishop sisters that appeared on the cover of the May 20, 2001, issue of the Chicago Tribune Sunday Magazine, Jennifer was the national chairperson of MVFR. The idea behind Murder Victims’ Families for Reconciliation is deeply good and deeply painful–and even resolutely practical. It’s that for some surviving loved ones of murder victims to be able to grieve and move beyond grief, they need to establish a relationship with the person who killed their loved one, in order to try and forgive the killer. That sounds almost saintly. But think about it: In most cases, the killer knows what happened, knows what a person’s loved one said and did in their final moments. And survivors want to know what happened. It’s a deep and heart-wrenching and possibly eventually healing relationship that results. I felt (and still feel) privileged to have been able to get to know and tell part of the extraordinary life story of the Bishop sisters and their love for each other.